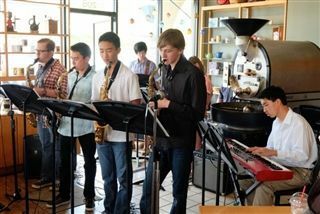 On March 15th, students in Jazz/Rock and Honors Jazz/Rock Ensembles took part in a benefit performance at La Costa Coffee Roasting. The performance was part of the Youth Helping Youth concert series for Banding Together, a local organization dedicated to providing music therapy for kids with special needs. The series of six fundraising concerts at coffee shops around encourages musicians, families with special needs and the general public to gather, enjoy music, and contribute to music therapy scholarships and programs.